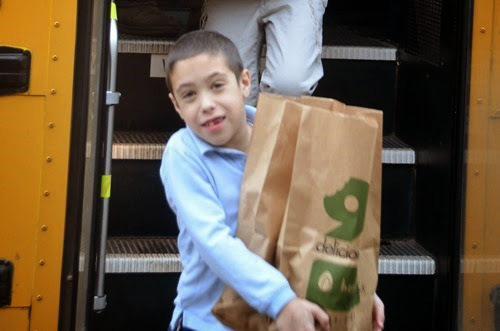 A mitzvah (plural: mitzvot) is generally translated to mean “good deed.” I have been so proud of my kids this year for going every Sunday with Dave to deliver food via the Meals on Wheels program. They have enjoyed seeing the people that they deliver food to, and it seems like the recipients enjoy seeing the kids too. Both Gabbie and Zachary have recently gone on Mitzvah Trips with school. Gabbie’s trip was to a local nursing home, where she and her class sang songs to the residents. They visited one woman in particular who cried when they finished singing. Gabbie was very proud to share this with me! 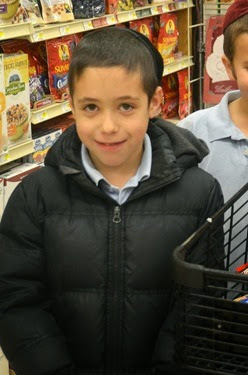 Zachary’s trip was to the grocery store to purchase food and then to the food pantry to deliver the food. The class saved their money so that each kid had $23 to use – or as Zachary told me, it was actually $46 because they worked in pairs. Zachary emptied our large tzedakah (charity) box to bring in the money that was inside. Each day the class counted up their money and they were so excited to use it to shop at the store. 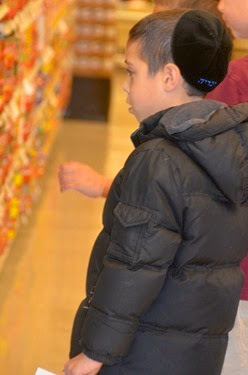 The two 2nd graders were pairs with an older student in 6th grade to do their shopping. The kids seemed to get a lot of out the trip! Next, we are planning to go through all of our toys and donate the ones we don’t use anymore. The kids are excited to do this, but I’m concerned that there will be fights over what we are keeping and what we are donating! I will let you know how it goes!